Learn about our flexible listing program! Our flexible listing program is designed to give you the freedom to sell your home (and save money at the same time) however you want. As real estate experts, we are here to guide you in the right direction in what ever way makes you feel most comfortable. Our flexible listing program allows for many different situations that may arise while selling your home, yet still taking advantage of our full marketing suite of services and expert consultation when needed. Maybe your neighbor, a friend or family member thinks your home is exactly what they're looking for after seeing our beautiful professional marketing rolled out and showcasing your home looking it’s absolute best; our flexible listing program allows you to save money and sell your home YOUR way. With a buyer on board, you can handle all the details and take your home safely to closing. However, finding an interested buyer for your home can definitely be challenging. Often times a successful real estate team may already have a buyer for your home. Our flexible listing program can take that responsibility off your shoulders so you can focus on moving and all the chaos that comes along with such a big transition. Our special program can help you work less and more importantly, PAY LESS. Many real estate brokers lock their clients into paying the full commission despite the many ways a home may sell. With our flexible listing program, you are not locked into any single fee and can even sell your home for a reduced amount using our expert marketing plan. We can provide you with cutting edge marketing strategies and full service at a smaller cost and faster sale! 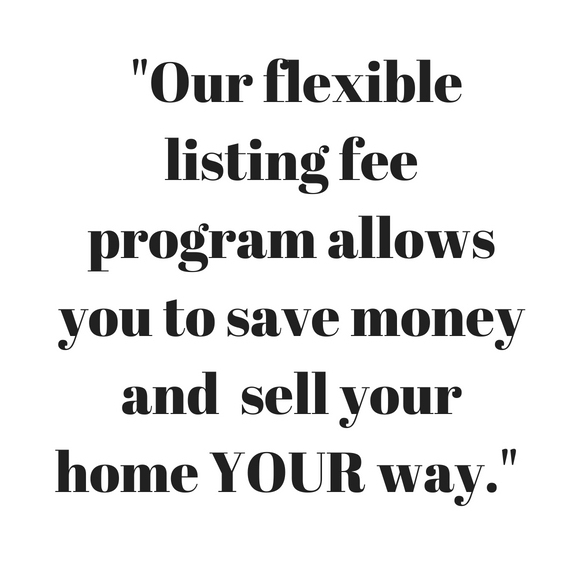 Reach out today to learn more about our Flexible Listing Fee Program.